The above plant yielded over an ounce of dried, cured bud from a soil grow in a one gallon container. I didn’t top the plant at all (which could have increased the yield) since I was growing several of these at once looking for different phenotypes. I was very pleased with the results, and would definitely recommend this strain to any grower – novices and cracks alike – who want a vigorously growing, pest resistant plant that produces a great smoke with a balance of flavor, resin, and kick. For the smoke reports on this blog, I’ll try to be descriptive without being too flowery… it’s a fine line. I can imagine that anyone who enjoys marijuana has picked up some commercial grass that was not bad, but not great either. Let’s consider that to be our “5” on the scale of 1-10 for rating aspects of the finished, cured bud. A “1” would be a total fail, and a “10” must be the Holy Grail of cannabis bud in that category. Grow Notes (Easy/Medium/Difficult, lighting, substrate, fertilizer, etc. ): Easy. Seeds all germinated in less than 24 hours, and had a first set of leaves in just a few days. The indoor grow plants were vegetated on a windowsill and on cloudy days under 140 Watts of LED for 4 weeks. Grown in 1 gallon pots using soil (see our recipes in other posts and in our ebook). To keep it very “home grown”, the plants were fertilized using tomato fertilizer at 1/2 strength in week 2 of vegetation, and 3/4 strength in week 3. They required a dose of magnesium in week 3, as well. During flowering, they received a molasses fertilizer mix, which is also detailed in our ebook. Flowering time & lighting: After week 4 of vegetation, the plants were placed under 250 watts of mixed LED & CFL lighting (which provided about 24,000 lux to the plants). Within a week, they were clearly flowering. They were harvested after 7 weeks of flowering, for a total of 11 weeks (about 80 days, considering germination) from seed to harvest. 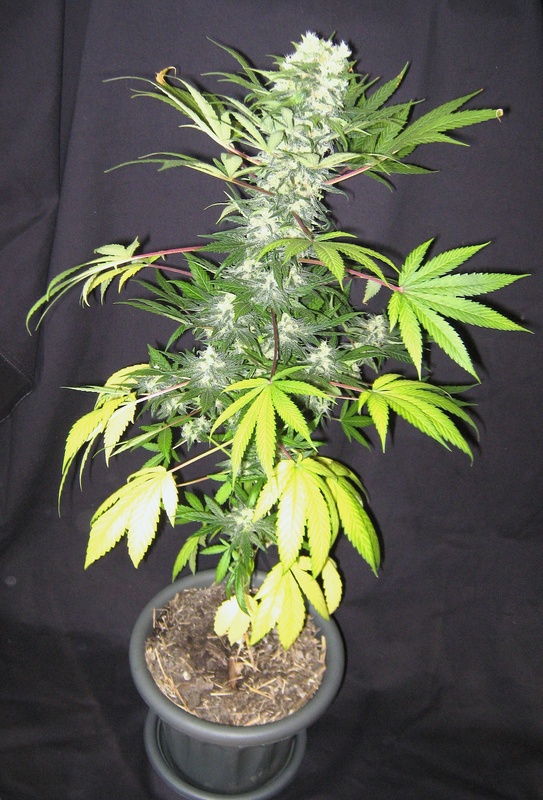 This is not bad at all – many autoflowering varieties require 10 weeks or a bit more. That extra week added considerably more bud to the harvest. Special notes: Curiously, this strain was rather skunky smelling late in the vegetative phase, but as flowering began, the smell all but disappeared. After about 3 weeks of flowering, a strong hemp (rope) smell was apparent, which became “skunkier” as flowering progressed. I’d say that although you do need air filtering, the WSS Skunk leans toward the “less smelly” side of the spectrum. Not as mild as Northern Lights, but certainly not a “Cheese” or “Diesel” style stinker. Phenotypes/Strain stability: I was pleasantly surprised at the consistency between plants, and was treated to one phenotype that stood out; a shorter, bushier plant with very dark (almost black/purple) leaves and very compact buds. The leaves were somewhat more sativa shaped, but without any of the stretch one might expect from a sativa phenotype. The aromas of this plant also stood out as very different from the rest, with much less skunk odor, and a rather more diesel & lemon aroma. Dry/Cure time and method: Dried for 1 week in a box drier (instructions for a DIY drier and a whole lot more in our ebook) and then cured in glass jars for 3 weeks. Bud appearance: 6 – Fairly compact buds that cured to a gray-green color with red/orange pistils. After drying, dried trichome “crystals” were obvious on the main buds, but not so much on side branch buds. This takes the “bling” factor off the appearance, but doesn’t mean it’s a weak smoke! Aroma/Flavor: 7 – Besides the one standout phenotype described above, the aroma was more pine/lemon than skunk. In a vaporizer, an invigorating mint note comes through on inhaling, with the pine/lemon taste lingering after exhaling. Considering the “Skunk” name of the strain, I must say that I have experienced much “skunkier” buds. However, since the skunk smell is not high on my list of favorites, I was pleased with the results. Some of the plants produced more resin than others, and the more resinous buds were by far better for the vaporizer; when burned, the resin did have an unpleasant “rope” taste that overwhelmed the finer lemon/citrus aromas. Effects: 6 – Effects lean heavily relax/body stone, lasting 1 1/2 – 2 hours. A fine evening smoke that ends in a desire to drift off to dreamland. No heart racing or anxiety to speak of, nor did it leave us with “dry mouth”. Honestly I’d have liked a touch more sativa “energy” in the mix, which is what I usually expect from a good skunk. The dark, diesel/lemon phenotype had this, but the rest did not. Perhaps this was just the way our batch of seeds turned out, but since we grew 8 of the 10 seeds and only one of those appeared, I take it to be the exception, not the rule. Downside: Not enough cerebral high. Upside: A pleasant high with little to no negative effects. Great for stress & pain relief, appetite stimulation, and to alleviate insomnia. Overall, I was impressed by the price/performance of this strain, and would most certainly grow it again. The mellow high made it a good relax/evening smoke without being a straight K.O. couchlock. Cheers to Weedseedshop for making this one available to budget growers, who can benefit from knowing that they will get a female plant, and can expect an above average smoke. These are far better than rolling the dice on found seeds, and come in at just $3 a plant! Thanks for tuning in. Please check back soon for more tips, techniques, and reports about cannabis cultivation for the budget-minded grower. Supercharge your next grow, and get results like ours by ordering our ebook. Thanks for your support!